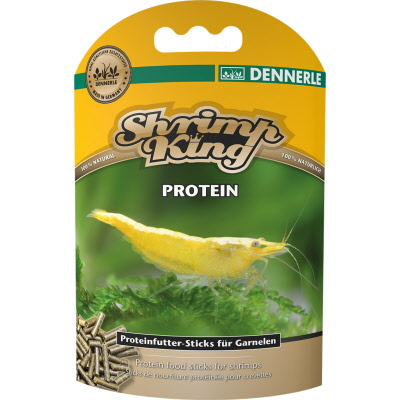 For targeting dietary supplementation with premium quality proteins and essential amino acids, feed your shrimp Dennerle Shrimp King Protein Food Sticks. This protein supplement comes in the form of sinking, water-stable sticks. Shrimp King Protein has significantly higher protein content compared with our main food at 42.2%. Use it as part of normal feeding for variety and as a nutritional supplement. 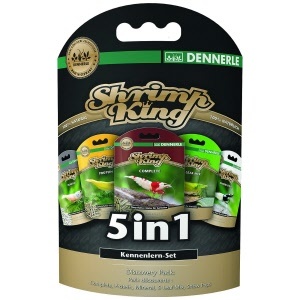 But the real advantage of Shrimp King Protein is evident during reproduction and egg formation. Shrimp species that naturally need more protein can also feed appropriately. The proteins and essential amino acids are derived primarily from aquatic animals (Gammarus, Daphnia, decapsulated Artemia cysts, shrimps, green-lipped mussel). The result is optimum nutritional composition and bioavailability. Guarantee: Free of synthetic colors or preservatives, and free of fish meal. Tip: Shrimp King Protein is also excellent for feeding other species during breeding and egg-laying, such as crawfish, dwarf crawfish (CPOs), crabs, long-arm shrimp, and snails.